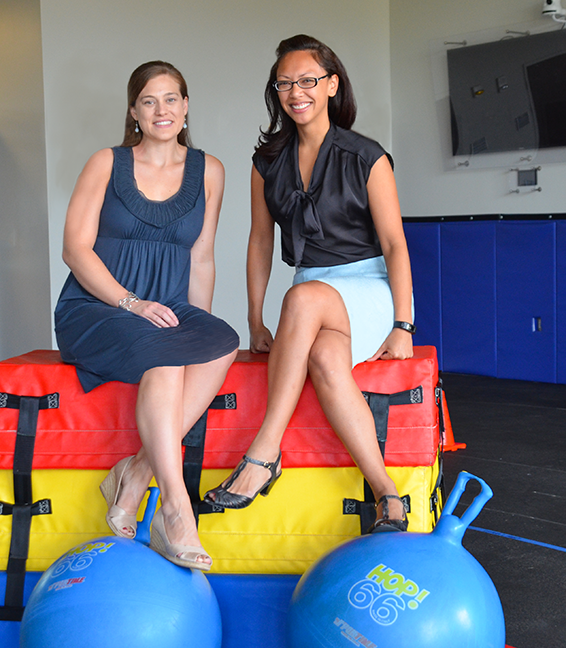 Dr. Melissa Pangelinan, Assistant Professor in the School of Kinesiology, is the co-director of the Pediatric Movement and Physical Activity Lab. The lab seeks to better understand how movement ability and physical activity participation affect brain and physical development in children and adolescents – particularly those with developmental disabilities such as autism, ADHD, cerebral palsy, and other developmental disabilities. The lab is working to develop age-appropriate interventions that will promote physical activity participation, which will in turn impact the long-term development of brain and physical health in those with and without movement difficulties. A key component of this effort is a free monthly seminar in the lab for parents of children with developmental disabilities. In collaboration with Lee County Autism Resource & Advocacy and Lee County Special Olympics, these seminars link parents with experts in movement science, education, psychology, and medicine. The seminars are held the third Thursday of each month at the School of Kinesiology, which is located at 301 Wire Road in Auburn. The first seminar in September welcomed approximately 60 parents and 75 children, along with a dozen or so researchers and 40 volunteers, most of whom were Kinesiology undergraduate and graduate students. The next seminar is scheduled for October 22nd from 6:30 – 7:30pm. “We have many dedicated volunteers, who are interested in physical therapy, occupational therapy, special education, and adapted physical education. As such we are able to keep a ratio of one volunteer for every two children. As our program grows, we will recruit additional volunteers to maintain a similar level of support for each child or teen,” Pangelinan said. During the monthly meetings, invited speakers discuss topics of interest to parents while the children engage in age- and ability-appropriate movement activities facilitated by Kinesiology student volunteers. Pangelinan was part of a similar and successful effort in her doctoral work at the University of Maryland, which was supported by several grants from the National Institutes of Health (NIH). The support group for parents at Maryland focused on three basic issues: getting support in school, understanding the impact of the disabilities on siblings and parents, and helping to promote physical activities for the whole family. She hopes to have a similar focus in her Kinesiology lab at Auburn. Regardless of the disability, there are similar concerns and problems for the families, Pangelinan believes. They almost always share the same pediatricians, physical therapists, and clinicians, but lack meaningful support and community. She hopes this effort can address those deficits right here in East Alabama. Pangelinan is supported in her efforts by Kinesiology doctoral student Megan Irwin, whose Master’s work was in disability studies and her dissertation is on autism. Irwin was an integral part of bringing together the initial group seminar event since Pangelinan is new to Auburn. Pangelinan also sees natural collaborations between her lab and College of Education colleagues such as Doris Hill and Vanessa Hinton, both of whom have strong commitments to working with young people with disabilities. In order for the outreach and research programs to be successful, Pangelinan needs to determine if they have the necessary commitment from area families to build a sufficient community. She also needs to win grant support for her projects, based on the NIH model she was part of in Maryland. If support is available, Pangelinan wants to expand the model to host a three-week day camp in the summer. The camp would focus on key areas of difficulty: riding a bike, swimming, and mindfulness training, which is an area of growing importance in managing emotional and attention difficulties. If the camp comes to fruition Pangelinan knows she will need volunteers, but also hopes to count on the enormous talent that could come from the College of Education’s early childhood, special ed, and rehab and disability programs.